Canoes line the sandy beach while people frolic in the background on the shores of Echo Lake in the Qu'Appelle Valley in Saskatchewan, Canada. 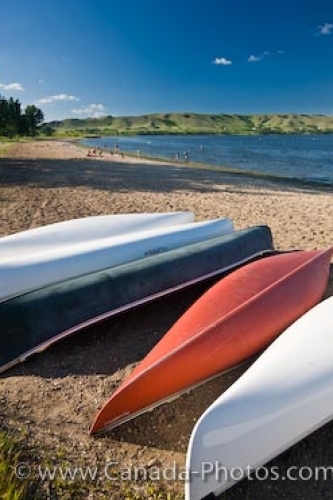 In the background, people enjoy the beach and water along the sandy shores of Echo Lake in Echo Valley Provincial Park in the Qu'Appelle Valley, Saskatchewan, while canoes sit on the beach waiting to be used. Canoeing is a favorite past time by many visitors to Echo Lake along with kayaking, fishing, picnicking and swimming. Echo Lake is one of the two lakes in Echo Valley Provincial Park, the other being Pasqua. Green, rolling hills separate the two and the landscape in between is where summer fun begins as change rooms, play areas, mini golf, volleyball and picnic areas have been built. Picture of canoes along the shores of Echo Lake in the Qu'Appelle Valley in Saskatchewan.